welcome you to our website ART GLASS NOUVEAU. Our shop is located in ROGERS ANTIQUES GALLERY, 65 Portobello Road, London W11 (map). 2) BY MAIL ORDER TO CUSTOMERS IN THE UK AND WORLD WIDE. OUR SHOP ON PORTOBELLO ROAD IS OPEN EVERY SATURDAY FROM 7.00 AM UNTIL 3.30 PM. We are based in the UK's famous London Antiques market of Portobello Road in London W11. Roger’s Gallery at 65 Portobello Road, London W11. The Gallery consists of over 30 shops and stalls and ours is the largest shop at the front of the Gallery. You will find us on the left as you enter from Portobello Road. Here is a link ROGERS ANTIQUES GALLERY, 65 Portobello Road, London W11 (map) to a map of the location of the Gallery. Our shop is only open on Saturdays. Portobello Road is a world famous, one day a week, antiques market only open on Saturdays. The Market starts at about 5.00 am but Roger’s Gallery (and our shop) is open to the public from 7.00 am until about 3.30 pm. Portobello Road is a very popular tourist attraction so serious antiques buyers should try to visit before 10.00 am, before the crowds start to arrive. A Museum quality, exceedingly rare, early GALLE acid etched and enamelled vase mounted in a humorous bronze mount showing the gardeners' enemy, snails, crawling towards the fruit on the vase. 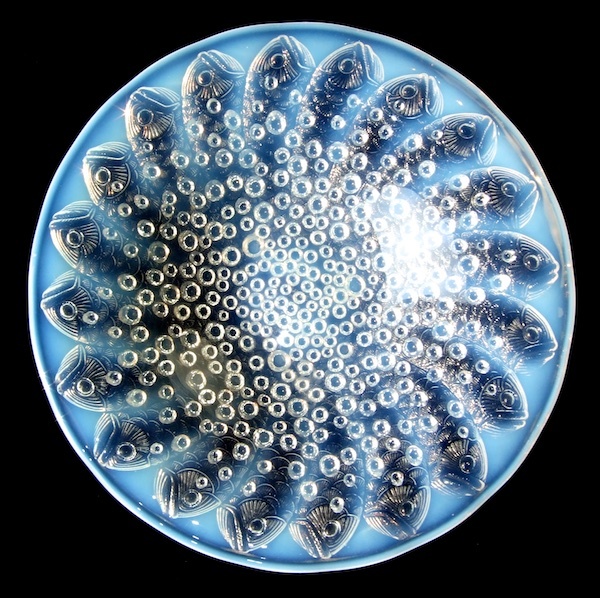 Click on the photograph to view an equally rare vase by the artist Charles Schneider. We are always interested in acquiring similar rare vases for our specialist collectors. We welcome enquiries from collectors wishing to obtain such rare vases or from people who wish to dispose of collections or individual pieces. Please Email us with your requests or offers. 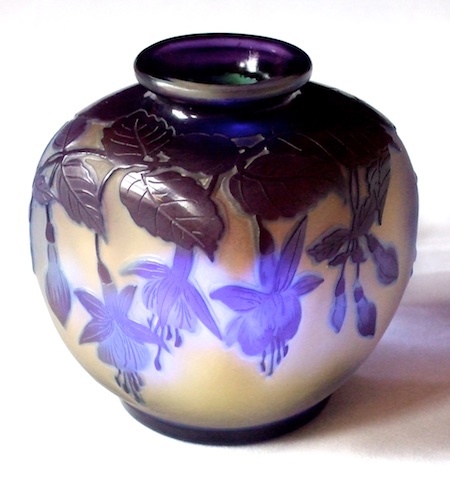 We are a family run business and have been trading in Art Nouveau and Art Deco Glass since 1981. 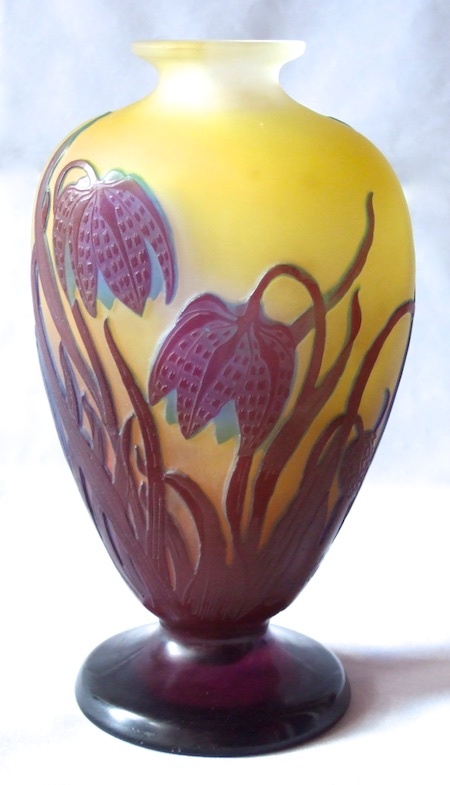 As with many dealers, we were collectors of Art Nouveau and Art Deco glass for many years (our special interests were Daum, Galle, Loetz and Thomas Webb) before we became SPECIALIST DEALERS, dealing mainly in Continental, English and American Art Glass. and the GREAT CZECH GLASS HOUSES including PALDA, HARRACH and HOFFMANN. These are the first examples we have ever seen of this Daum organic form that presents the "Woodland Summer Landscape" design to amazing effect . Please click on the photograph for a view of a jug with the charmingly beautiful naturalistic DAUM Cornflower design. These very rare Daum creations are fully described on the DAUM PAGE. 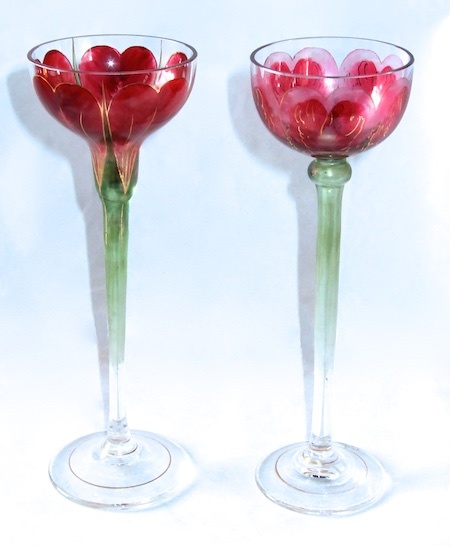 We have been very lucky to acquire these two examples of the very rare Fritz Heckert flower form enamelled liqueur glasses to add to our large and constantly changing collection of Flower Form drinking glasses. These stunning FRITZ HECKERT vessels are described in full on the ENAMELLED GLASS PAGE of our website of ever changing art glass treasures. Click on the photo for a view of a group of these figures. 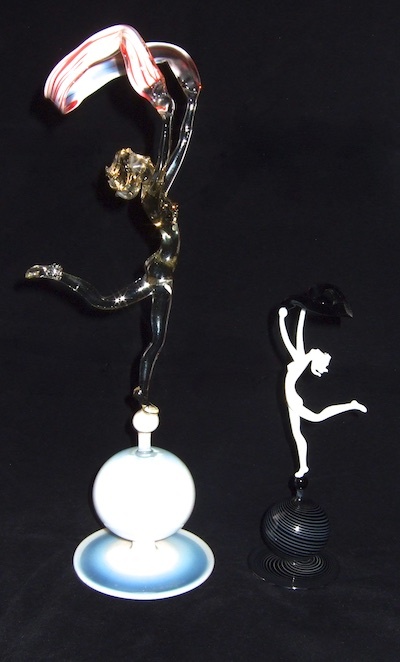 These beautiful KOMARONY ART DECO style lamp blown dancers differ in sizes and design with varying coloured bases. 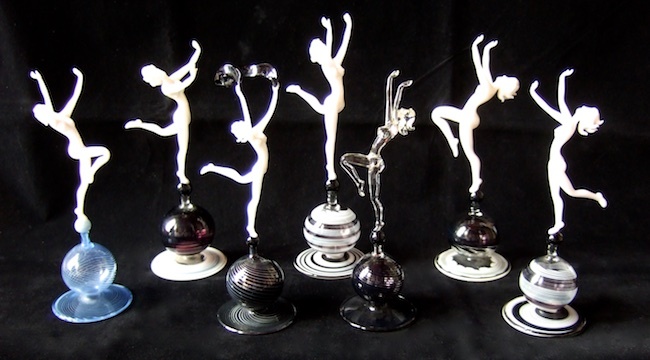 A full description of these and other charming KOMARONY figures can be found on the OTHER GLASS HOUSES PAGE. This superb piece of LOETZ TITANIA glass is from a specialist collection of Silver Overlay vases that we hold in a constantly changing collection as we try to satisfy the interests of our specialist collectors. The majority of the iridescent glass vases were produced by Loetz along with other Bohemian glass manufactures while the Sterling Silver was applied in America by factories such as 'Alvin' and 'Le Pierre'. The LOETZ TITANIA vase illustrated here is especially rare as the Silver overlay is in the Secessionist style and was applied in Europe rather than America. Our stunning LOETZ silver overlay cabinet vases are described in full on the LOETZ PAGE of our website of ever changing art glass treasures. Please click on the photograph of the Titania vase to see part of our collection of Loetz silver overlay vases. PLEASE CONTACT US IF YOU WOULD LIKE US TO SUPPLY ANY SIMILAR SPECIAL ITEMS FOR YOUR OWN COLLECTION. We have recently acquired some unusual and beautiful DAUM miniature and small vases. This "Bleeding Hearts" miniature pillow vase is a later production Daum creation in vitrified cameo glass with enamel detail. Please click on the picture to see a different example from our collection. 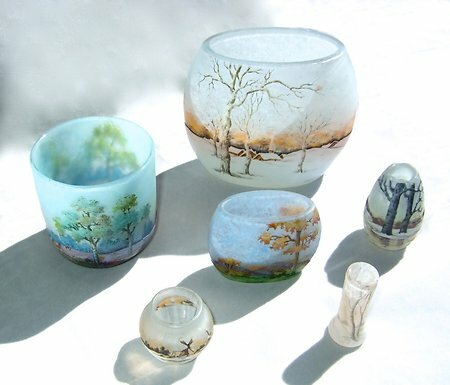 Several superb mini DAUM vases are described in detail on the DAUM PAGE of our website of ever changing art glass treasures. A beautiful LOETZ COBALT NORMA vase in silver blue mirror iridescence on a cobalt ground with applied citrine handles and rim. Please click on the picture to see another Loetz vase. 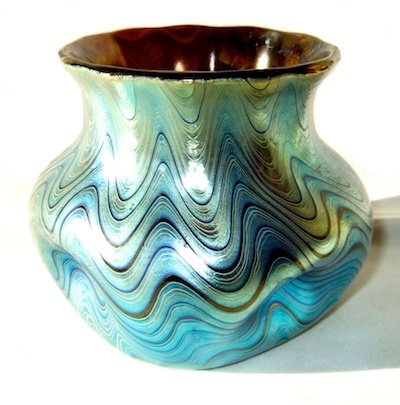 This superb vase is described in full on the LOETZ PAGE of our website of ever changing art glass treasures. 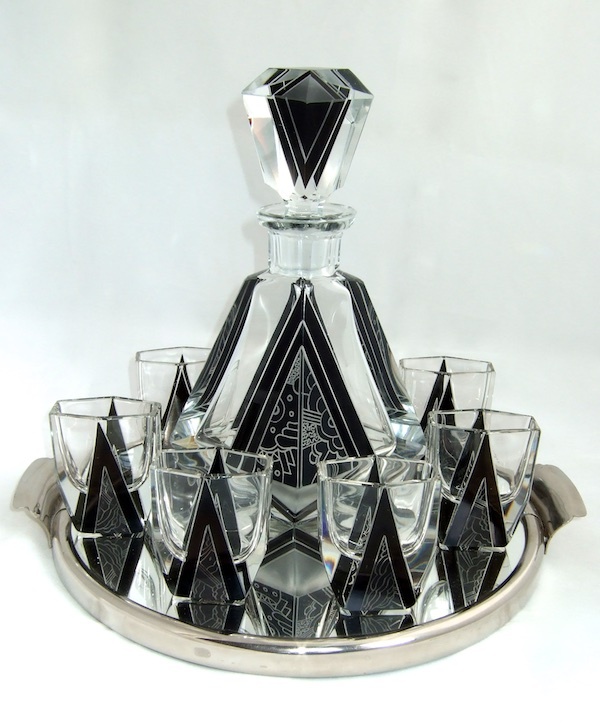 This wonderfully dramatic classic ART DECO enamelled drinks set by KARL PALDA is one of a collection of Czech ART DECO drinks sets that we have recently acquired. Click on the photograph for a picture of another stunning set by Karl Palda. Both these dramatic decanter sets are described in full on the ART DECO GLASS PAGE of our website of ever changing art glass treasures. This stunning ROSCOFF coupe ouvette is one of five new RENE LALIQUE plates that we have recently acquired. Please click on the picture to see three other pieces. 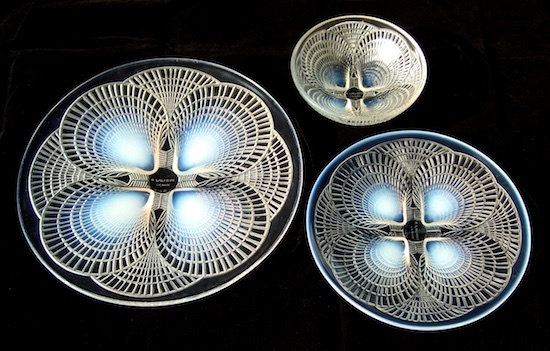 These superb pieces are described in full on the RENE LALIQUE PAGE of our website of ever changing art glass treasures. Please click on the picture to see another view. 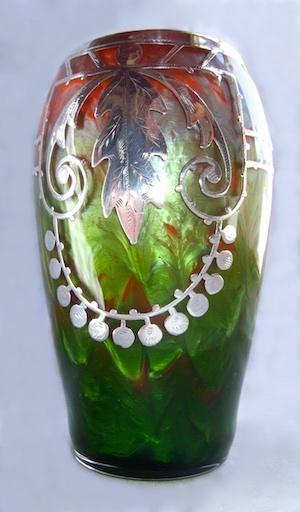 This dramatic vase is described in full on the GALLE PAGE of our website of ever changing art glass treasures. Illustrated is a stunning Loetz 'RUBIN (silver blue on red) PHAENOMEN GENRE' small cabinet vase that we have recently acquired. 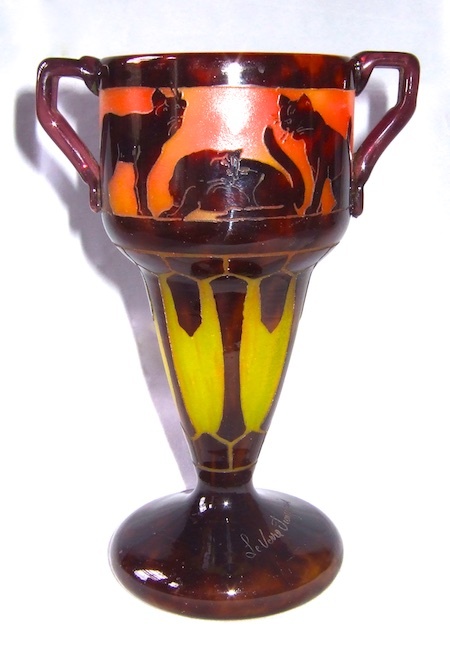 Click on the picture to see a superb Loetz 'PHAENOMEN GENRE - MEDICI' vase that has also recently entered our collection. 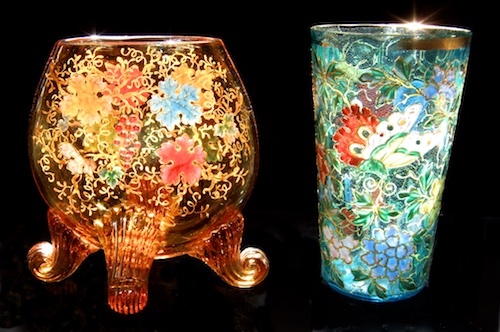 Both these stunning vases are described in full on the LOETZ PAGE of our website of ever changing art glass treasures. 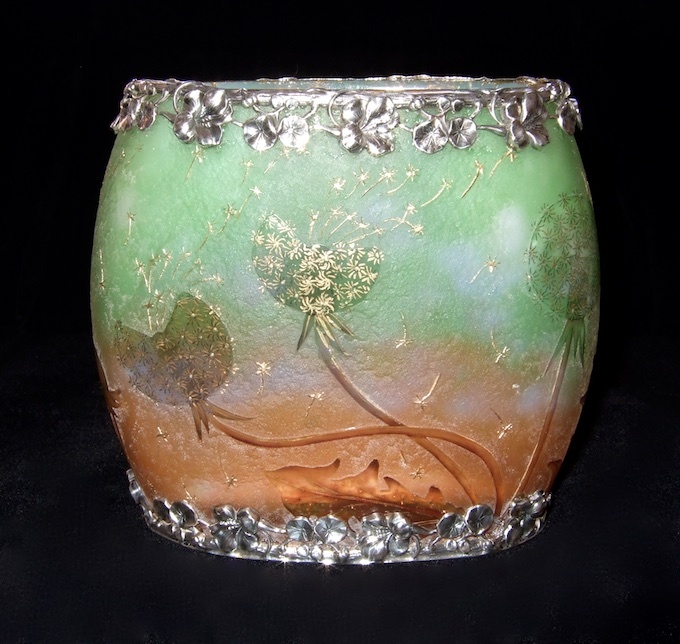 We have been very lucky to acquire this superb AMALRIC WALTER PATE DE VERRE vase sculpted by HENRI BERGE. 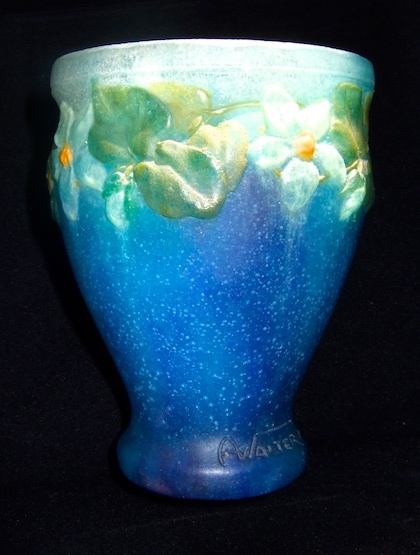 Also acquired is a very lovely Gabriel Argy-Rousseau PATE DE VERRE vase. Please click on the photograph to see this other vase. Both these stunning vases are described in full on the OTHER GLASS HOUSES PAGE of our website of ever changing art glass treasures. 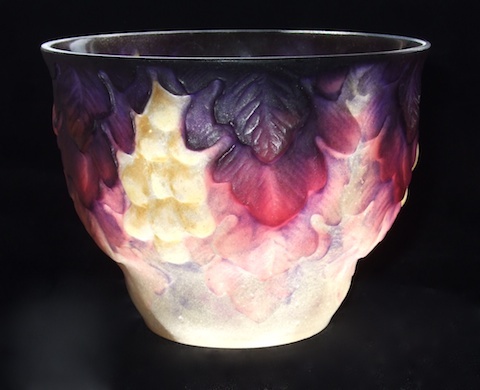 A stunning GALLE internally cut back Fuchsia cameo glass cabinet vase of rare square GALLE form. 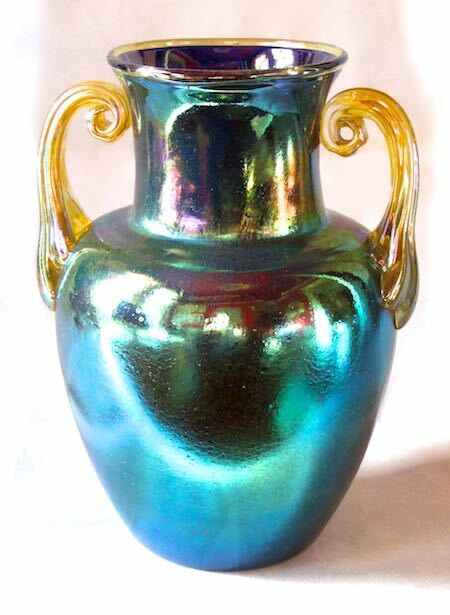 Please click on the photograph to view another exceptional GALLE internally cut back vase. 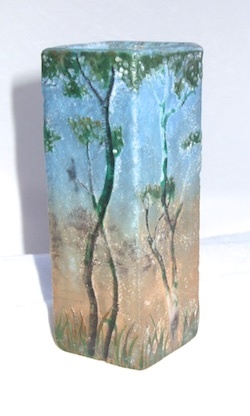 These stunning vases are described in full on the GALLE PAGE of our website of ever changing art glass treasures. This stunning 'GEORGETTE' BONBONNIÈRE is the second to largest of the boxes created by RENE LALIQUE in opalescent glass. Please click on the photograph for a picture of the closed box. 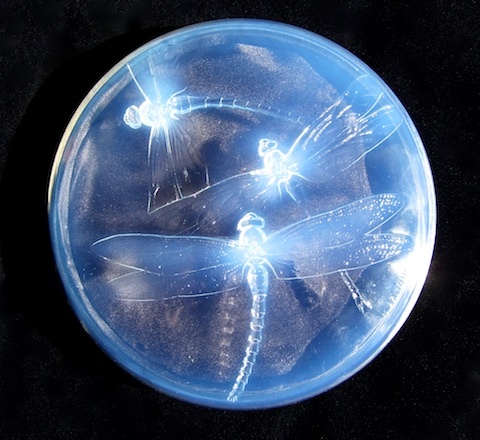 This superb box is described in detail on the RENE LALIQUE PAGE of our website of ever changing art glass treasures. During the past two weeks we have been lucky to acquire two collections of Daum glass, mainly miniatures. A Daum egg and a Daum pillow vase miniature, both with designs that we have never seen before, were quickly snapped up by regular visitors to our shop on Portobello Road in London. We have ADDED four of the Daum vases to our DAUM PAGE and illustrated a group of them at the top of the same page. The remainder may be viewed in our shop on any Saturday. 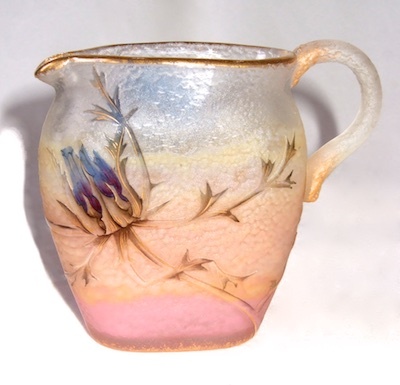 We also acquired two beautiful pieces of Thomas Webb cameo glass that I hope to add to the web site soon. It will be seen from this account of sales that we can't list all our stock on the web site pages and so it is always worth trying to visit our shop on Portobello Road in London, UK in ROGERS ANTIQUES GALLERY, 65 Portobello Road, London W11 (map) or contacting us to enquire about items that might interest you but are not displayed on the site. You will see from this blog that many of our rare pieces sell to other dealers. If the 'trade' are buying our stock then collectors can be assured of getting pieces at very reasonable prices. Come and see us at Portobello Road any Saturday. ALTHOUGH MANY OF THE PIECES ON THE WEBSITE ARE SOLD, WE ALWAYS HOLD A LARGE STOCK OF SIMILAR ITEMS AND WILL CONSTANTLY TRY TO UPDATE THE SITE WITH SOME OF THESE NEW ACQUISITIONS. IT IS ALWAYS WORTH CONTACTING US BY EMAIL OR TELEPHONE TO ASK IF WE HAVE SOMETHING NEW OR SPECIAL THAT WILL HELP WITH YOUR COLLECTION. 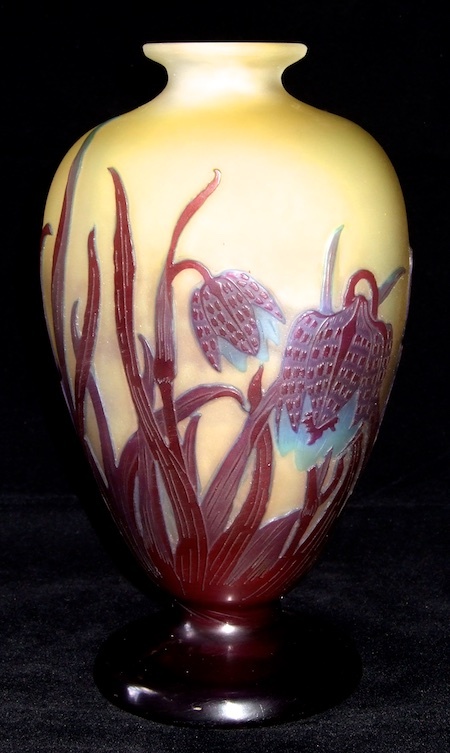 'ROGER HARRIS' is a Specialist Dealer of Art Nouveau and Art Deco Glass based in West London, UK. As a PADA Member an Antique Dealer must subscribe and adhere to a six point Code of Practice which reassures Customers that all items for sale are genuine as described and that any transaction is fully guaranteed. VIEWING OUR STOCK OF GALLE, DAUM, LOETZ, LALIQUE, TIFFANY, MOSER, WEBB, LEGRAS and other great ART NOUVEAU and ART DECO glass makers. Our Website only gives you a small ‘taster’ of the complete stock of GALLE, DAUM, LOETZ, LALIQUE, MOSER, WEBB, TIFFANY, LEGRAS and other great ART NOUVEAU and ART DECO glass that is available for viewing by the Collector or Dealer on our stand in Portobello Road. It has been said that "ROGER HARRIS is probably the foremost Art Nouveau glass dealer in LONDON, he is a renowned GALLE glass dealer and DAUM glass specialist......we recommend you visit his shop on Portobello Road when next in the UK or visiting London". (Art and Antiques). which is situated at the very start of the more prestigious end of the Portobello Antiques Market. IMPORTANT: Please remember that PORTOBELLO ROAD, where you can buy a huge array of collectable and antique items, is an ANTIQUES MARKET and is therefore only open for one day a week on SATURDAYS. The market starts at 5.00am but ROGERS ANTIQUES GALLERY opens at 7.00am and closes at 3.30pm. Other Antique Dealers visit us from all over the World as our market is primarily a TRADE MARKET. We supply specialist dealers from many countries as well as the UK and our clients include several of the most famous museums as well as major collections. The PRIVATE COLLECTOR benefits as we are not a Retail Outlet; the prices marked on our stock are already discounted to appeal to the foreign trade dealer. We only have one price for all and so the PRIVATE COLLECTOR can be certain of getting the very best of deals. 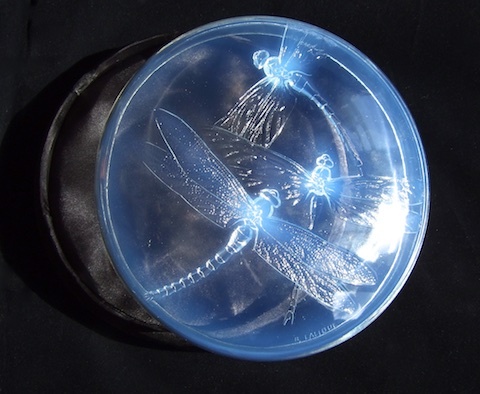 Because we are SPECIALIST DEALERS and have been established for a long time we are known throughout the ART NOUVEAU GLASS world and have many contacts and searchers who supply us with RARE AND PRECIOUS COLLECTABLE PIECES that have never been seen by other dealers. We often buy-in whole collections and are always happy to buy back pieces we have sold. We never buy from Auctions and so our stock is always ‘fresh’. We would always recommend that you visit us on a Saturday at Portobello Road where you can see and handle our stock and we can discuss your collection and the quality of any collectable item that might interest you. Failing this we would be very happy to meet you at any of the Major Fairs where we exhibit. We display at the NEC Birmingham ANTIQUES FOR EVERYONE fairs and have stands at all the major glass fairs in the country. Links to these fairs and dates when we are exhibiting are listed below. If you are unable to meet us then we are of course happy to deal from the website and we recommend that you E-mail or telephone us first about any piece that interests you. We accept UK £ (POUND STERLING) cheques. We can process debit cards and all the major credit cards including AMEX. You can pay by Paypal (this permits you to safely and securely pay from almost anywhere in the world, in any currency, from your bank or via your credit card). We can receive bank transfers via IBAN. AFTER FORTY YEARS OF TOURING THE COUNTRY AND EXHIBITING AT VARIOUS FAIRS WE ARE FINDING THE 'EFFORT' A LITTLE TOO EXHAUSTING AND SO HAVE DECIDED TO STOP EXHIBITING AT FAIRS. WE ARE SORRY TO DISAPPOINT OUR MANY REGULAR CLIENTS WHO WE HAVE ALWAYS LOOKED FORWARD TO SEEING UP AND DOWN THE COUNTRY, BUT OUR FULL STOCK CAN ALWAYS BE VIEWED ANY SATURDAY IN OUR SHOP ON PORTOBELLO ROAD IN LONDON ROGERS ANTIQUES GALLERY, 65 Portobello Road, London W11 (map) WHERE WE SHALL BE PLEASED TO GREET YOU AND DISCUSS YOUR NEEDS AND HOPEFULLY SEE MANY OLD FRIENDS. 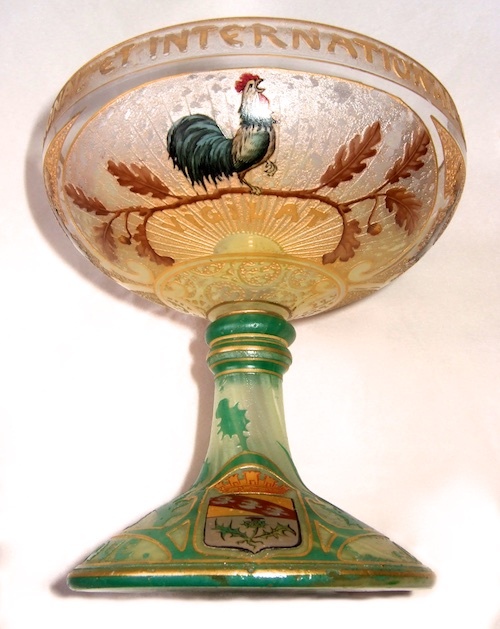 CZECH GLASS, PALDA, HARRACH, HEINRICH HOFFMANN, SCHLEVOGT.